The peripheral system of the vacuum brazing furnace includes vacuum system, water cooling system, inflation system, pneumatic system and furnace charging vehicle. Aluminum alloy brazing has very high requirements for vacuum systems. The vacuum system must not only have a sufficiently strong vacuum capacity, but also have enough capacity to ensure that a large amount of gas volatilizes before the brazing preheating section and the last brazing insulation section. 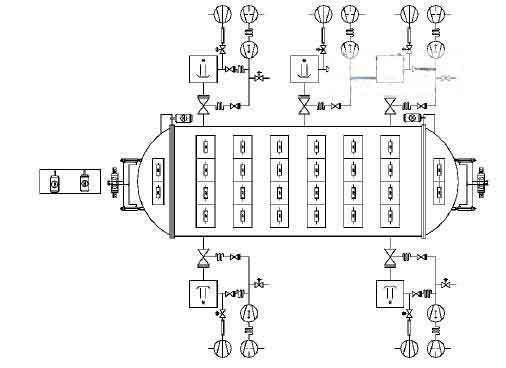 The internal vacuum is maintained in the order of 10 -3 Pa, which requires a faster and stable pumping speed in the vacuum system. The model vacuum brazing furnace is equipped with 5 sets of vacuum units. The configuration of each set of vacuum units: the main pump is a high vacuum oil diffusion pump, and the oil diffusion pump belongs to a steam jet pump, which has a large pumping speed and a high ultimate vacuum. Advantages: The role of the mechanical pump unit is to pre-vacuum and the foreline pump as a diffusion pump. It is composed of a Roots pump and a slide valve pump: The maintenance pump uses a rotary vane pump, which can ensure that the diffusion pump is installed before the equipment starts to work. When heated, the pump chamber maintains a certain degree of vacuum, and it can also ensure that during the process of cooling the diffusion pump after the completion of the work, when the Roots pump and the slide valve pump are deactivated to save energy, the diffusion pump will not exhibit the diffusion pump oil oxidation. The valves of each vacuum unit include a large valve, a pre-stage valve, a pre-pump valve, and a unit purge valve. The water cooling system is used to cool brazing furnace walls, diffusion pumps, Roots pumps, slide valve pumps and rotary vane pumps. The main water inlet pipe is equipped with an electric contact water pressure gauge, and alarms when the water pressure is insufficient. Each of the water flows through the cooled components and flows into the return water tank. The back water tank is connected to the main water return pipe. The device has an inert gas inlet and is equipped with manual ball valves and manual needle valves. According to needs, nitrogen filling in the furnace can be replaced in the pre-evacuation phase. The equipment is equipped with a pneumatic system. The system is composed of gas source triple parts and pipelines, seals, etc. The pressure of the pneumatic system pipeline can withstand 0.8 to 1 MPa. It is used for components driven by the cylinder on the equipment, including the large valve and the preceding stage. Valves, pre-pump valves, and front and rear doors. The work vehicle is used for loading and unloading the workpiece. Its main body is a frame, and the frame size matches the maximum size of the workpiece after the loading, and is structurally strong enough to withstand the total mass of the load. The track fixed on the ground is used to support the frame and guide the frame movement. The forward and backward movement of the frame is driven by a gear motor (power 2.2 kW) fixed in the pit. The frame moves toward the furnace body. A pair of rails on the frame are connected to the square rails in the heating chamber, and another set of fixed gears on the frame (2.2 kW power) drives the workpiece trailer that can move along the rails to move forward and backward, moving together with the roller assembly The workpieces enter and exit along the guides in the furnace and on the frame, enabling loading and unloading. The movement of the frame and the entry and exit of the workpieces all have limit switches for the limit of travel, enabling accurate docking of the guide rails and in and out of the furnace.